Includes admission to the event from 10pm-2am, Open Bar, Chef Milly Buffet, champagne toast, DJ entertainment all night long, and an awesome view of the fireworks from the Roof Deck or outside the venue at midnight! 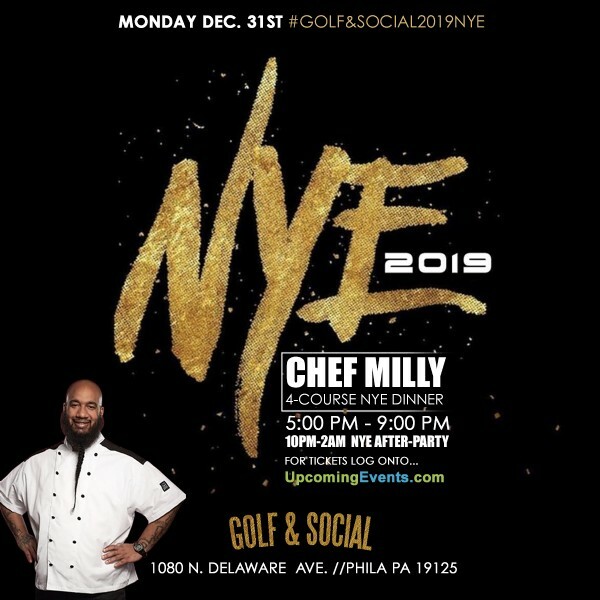 Ring in the New Year at the Golf & Social Club with an absolutely fantastic view of the fireworks on the waterfront - a Philly social hotspot! Two Special New Year's Eve event experiences! Chef Milly Four Course Dinner starts at 5pm and goes to 9pm! Includes General Admission ticket to New Year's Eve event! Just $149.95! The New Year's Eve Party Starts at 10pm and goes all night! Tickets will definitely sell out with this fantastic venue - make sure you get your tickets and we will see you there! View More Events Organized by Golf and Social. Golf and Social in Northern Liberties. This event is organized by Golf and Social.